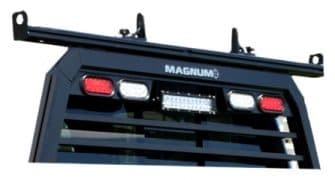 At Magnum, we pride ourselves in staying ahead of industry trends and taking the time to research what will benefit our customers most in the truck accessories realm. Our product development team is unparalleled in the headache racks industry. We truly value providing our customers with the best new products. We recently released two products that we’re incredibly excited about: the Front Rack Extension Tube and the Universal Detachable Rear Cargo Rack. The Front Rack Extension Tube sits on top of your Magnum headache rack to allow for wider load capacity (up to 72″). The Glide Track system on the top and rear face allow for easy installation of cargo stops, D-Rings, and just about any type of light or accessory. It comes with (2) quick adjust cargo stops, the extension rack tube with tie down holes, two rubber mounting pads to eliminate scratching the base rack as well as stainless steel mounting bolts and nuts. The aluminum Universal Detachable Rear Cargo Rack fits most trucks. This detachable rear rack is a simple clamp-on installation and is universally adjusted to width. The Glide Track system on the top and rear face allow easy installation of cargo stops, D-rings, ladder rollers, etc. It comes with (2) quick adjust cargo stops, the rear rack tube with tie down holes, vertical legs and (4) black powder coated installation clamps. The load capacity is 600 lbs distributed evenly. 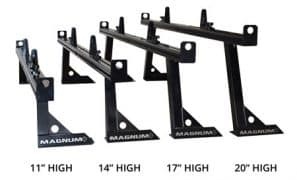 This product is ideal for anyone who uses their truck to haul whatever is most important to them; from the contractor who needs his ladders and other supplies, to the outdoorsman hauling canoes, kayaks, and more. This LED bar is super bright. If it’s installed with the backup lights, it floods your backup area so there’s no question what’s behind you as you back up at night. If you simply want to park your vehicle and need light in an area, this is the answer. These LED lights can be wired to a toggle switch allowing function when you’re not backing up. Once you have this light, you’ll wonder how you lived so long without the convenience. Price includes installation and wiring with backup lights. This Modular Plug-N-Play Wire Harness is designed to make installation of our lighted truck racks quick and easy. The 10’ wire harness runs under the bed of the truck and connects to the factory 7-way trailer light connector without losing the use of your 7-way plug. This eliminates the need for any tools or wiring skills. The Sliding D-Ring was designed to work with our Glide Track System. 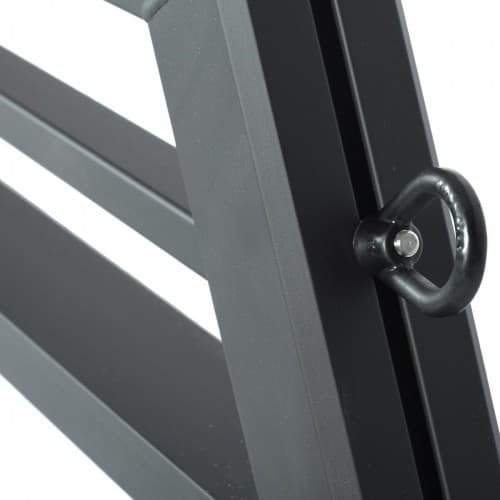 D-Rings are easily installed through the slots in the top and sides of each rack. Each ring is made of durable powder coated steel and is held to the glide track using steel square head bolts (included). Take the worry out of strapping down heavy cargo with our Sliding D-Rings.